I’m a huge fan of small, humble restaurants that are owned and operated by young couples, especially when one of them is the chef and the other runs the front-of-house. One of my newest, favourite restaurants is such a place. Sage, located on the second floor of Robertson Walk, is run by chef Jusman So and his wife Kimberly Chew. I first learnt about Sage a few months ago through a few friends. They were raving about this hidden gem of a restaurant that served fantastic food at great prices and never charged corkage. When they told me it was in Robertson Walk, I have to admit, I was a little doubtful. A few weeks later, some friends and I finally checked it out for ourselves. And from the first bite, I was totally hooked. Chef Jusman, who trained at the Hilton’s Harbor Grill & Oyster Bar, serves delicious, hearty, yet refined French food. What I like most about his dishes is that they’re elegant and comforting at the same time. When eating them, you can tell that Jusman has a great grasp of his fundamentals. His dishes are clearly steeped in tradition, but they’ve also been deftly updated by this young, talented chef. Since my first visit, I’ve been back several times and have tasted a good number of dishes. My two favourites so far are Jusman’s fricassee of Burgundy escargot with lentils du puy and field mushrooms, poached egg and Italian parsley foam, and his pastilla of braised oxtail meat and duxelle mushrooms on a sage and potato gratin, brunoise vegetables and a reduction of its own braising jus. I especially love the oxtail pastilla. It’s super-tasty, rich, and has fantastic textures, both crispy and soft at the same time. It’s an amazing and highly addictive dish. Unfortunately, on my most recent visit, I’ve discovered that Jusman has just taken it off his regular menu. That said, he did admit that he will still have a few available for regulars like me (the version at the top of the post is plated with a chestnut and truffle ragout instead of the potato gratin). 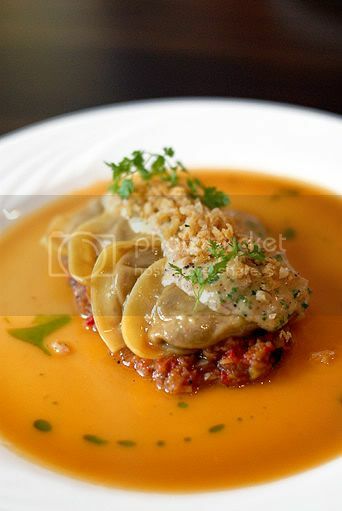 S and I recently tried out a couple of new dishes from Jusman’s latest menu, which he has just launched. In addition to my requisite order of oxtail pastilla, we tried an order of ravioli of lamb shank topped with sauce choron and crispy Parmigiano Reggiano, Provencal ratatouille and roasted garlic jus, and Jusman’s duck cassoulet (confit of duck leg with smoked pork belly and sausage, a ragout of haricot beans, parsley and fresh bread crumbs). Both were fantastic. 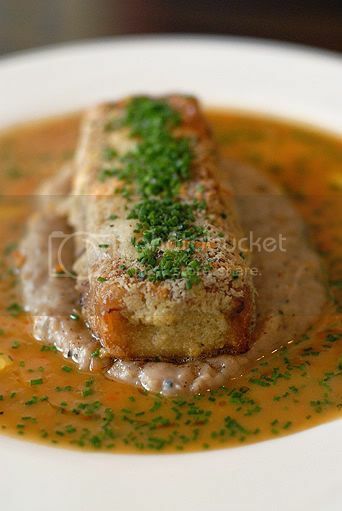 S especially liked the cassoulet, a dish that we’ve found hard to find here in Singapore. 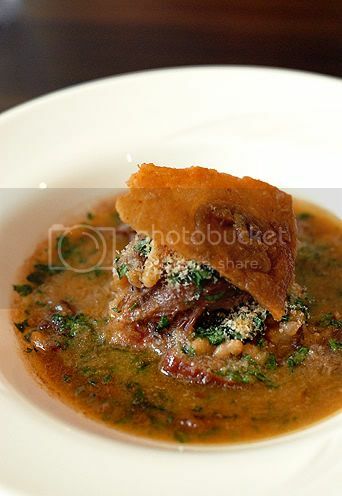 We’re also keen on trying a couple of his other new dishes, especially the medallion of braised pig trotter filled with lardons and sausage farci topped with French green lentils, grated eggs and sauce Bearnaise, and the blanquette of braised veal tongue on ragout of savory cabbage and lardons, sweet white onion confit and light mustard cream. For now, Sage is still pretty much a secret. But next Friday, 19 of Singapore’s better known food bloggers are going to be getting together there for dinner. So, pretty soon, I expect the word will be out. But that might be a good thing. A restaurant as good as Sage needs to be publicized and definitely deserves as much support as it can get. Sage is open for lunch only on Friday and for dinner Tuesday through Sunday. A three course dinner is S$50; four courses is S$55. They don’t charge corkage (for now). Hey chubby hubby, thanks for the write up. Im a fan of small local establishments as well. Sage is definitely worth a look. Hi Chubby hubby… I am a regular avid reader of your blog, and aspire to your culinary prowess. If you like small cozy establishments, you might like Tamon, located along East Coast Road, near Chin Mee Chin and Holy Family church. It is run by a Japanese chef and his Singaporean wife and family. The food is very homely and delicious… especially the beef yakitori! Hi Chubby Hubby– will you and S be at the Food Bloggers’ dinner? I RSVPed late, so am hoping a friend and I can still squeeze in. hi, i’m a young food lover, my name is brenda and am 15 this yr. i am totally crazy about food, i will read food reviews and food blogs everyday, no matter how busy i am with school work. i always want to try all the food at different restaurants but do not have the chance. i have an adventurous tastebud and loves to try out everything. i hope to be a gourmet or maybe try out cooking first. i even set up a food blog myself but does not seem to attract readers so i stopped blogging. is there anyway i can be attached to food industry? Hey CH..jus saw u (it was u in the blue shirt smiling shyly at the cam innit;-) & yr blog at the rally speech..gosh I was so excited, & was squealing with delight! Congratulations!!! Shaz: Definitely try it. Really yummy food. Mulchd: Thanks! I’ll definitely try it. Appreciate the recommendation. Andrea: Thanks. There are many non-beef dishes, so try to check it out. Francine: Just me, I’m afriad. S has other plans. Food-Gastro: It’s awesome that you are so interested in great food. Let me try and think about your question and I’ll email you. Its only open for lunch on Fridays? No wonder I rarely see anyone eating there, even tho I go to that area quite regularly…Could try it out soon, prices seem v reasonable! hi CH, were u among e audience at the Rally? Hi, I’ve been trying to make profiteroles for quite a number of times already, but the results are always the same – the puffs always “deflate” the second I remove them from the oven, even before I had the chance to pierce them for steam to escape. Any clue why this happens? hi, i’m a young food blogger and hope to be known and recognised as i have a great ambition of becoming a food critic or work in the fnb industry.do take a look at my blog, and i hope to attend the food bloggers gathering, please. If only I could be in Singapore, or if it were closer by, so that I can try all the nice places you give the review of….sigh…. Thank you for such an incredible blog! Wish I could fine another in the states which is close to yours! Yes I have visited Sage twice and i find their foods nice, presentation great and pairs well with wines. The recent one in June was with a Bandol Rose and a Pichon Baron 98 and 2001. It’s a nice place. Best of all, no corkage which is a rarity. I do agree that Sage can do with all the publicity it can get. It is very frustrating to find a good restaurant and then, realising that it does not feel like actively marketing itself as it wants to focus on the food. There are nights when I am there that I wonder how these guys have been staying afloat all these years (yes, they have actually been around for a while) and you just wish that they are able to make it, if not for any other reason, then at the very least, to allow them to do what they do best … whipping up a bit of culinary magic for the delight of an appreciative audience. Can you please email me directly about your profiterole woes at s@chubbyhubby.net? It would be great if you can give me some idea of what recipe you’re using and what temperature you’re baking them at. sorry what is meant by the term ‘corkage’ ? Me: Yah, was quite a surprise. Gwenda: Great. I’m glad it worked. Lol: Yah, I wish it was opened all week for lunch. Definitely try it out! Bea: Well, it sounds like it’s time for you to take a holiday and visit Singapore. Deb: Thanks so much for the kind words. Looking for a great blog in the US? Go to Matt Bites. It’s listed in my links. He’s a brilliant foodie! Winekakis: Yummy. I agree, it’s so hard to find a great place willing to waive corkage all the time. I love that I can bring whatever I want to Sage. Skates: I think the same thing. I was torn between keeping the place a secret and posting about them. But I think the more people know about the place the better. Fred: “No corkage” means that the restaurant doesn’t charge you if you want to bring your own wine. Most restaurants have a corkage charge — anything from S$10 up to S$30 a bottle. Your pictures are absolutely gorgeous and once again your blog has made my mouth water. I completely agree with you about small establishments too, I find that they often have the best food and the best service! Found another place with no corkage. It’s a small laid back charming eatery in the East called Foo House. Also a family run business so their service is very upfront and friendly. I fell in love with the porkloin. Yumz. Definitely worth going back. I know this seems a little out-dated to post any comments on this thread now…but recently started searching & reading online blogs on food reviews & stuff and came across this. I must say yours’ definately the most outstanding! If you’re still into family run restaurant, suggest you trying out a 3 month old homely place called Bistro One Zero Three at 103 Pasir Panjang Road. Tried their food there couple of times as its near my working place, both for lunch & dinner and found them consistant in terms of quality and prices very reasonable given the generous portions! They offer a small menu on Western-Euro comfort food which I understand gets adjusted on a monthly basis. Corkage is $5++, supposedly cos the last time I went with my friends for dinner, they waived it! Chef’s the husband and his wife & brother-in-law man the front! Really think they’re worth some marketing help! You can get some of the best food when going into small restaurants. A great way to tell is if there are people eating there.